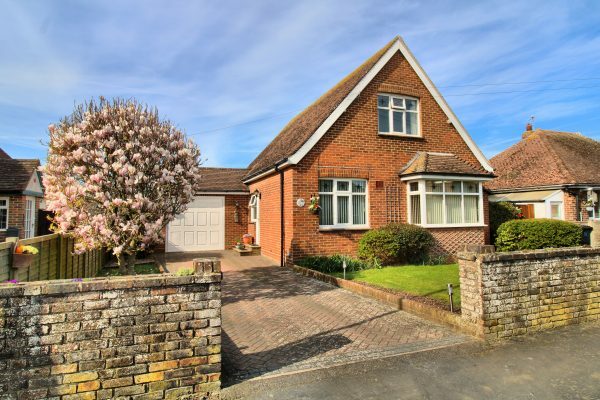 A spacious detached house backing South West in this popular residential area, near to local primary school and bus services operating along the main A259 to Eastbourne and Brighton. Seaford railway station and town centre are within 1.5 miles distant. The property has versatile accommodation comprising sitting room, kitchen/breakfast room with adjoining utility and dining area together with two ground floor bedrooms and newly fitted bathroom. The first floor accommodation has two further double bedrooms with distant views over adjacent properties towards downland and Seaford Head. Other features include uPVC double glazed windows and external doors, gas fired central heating, spacious garage with electronically operated up and over door. Brick paved driveway with space for several vehicles. Attractive front and rear gardens. If you would like to arrange a viewing of this property, please call our team on 01323 898 414.